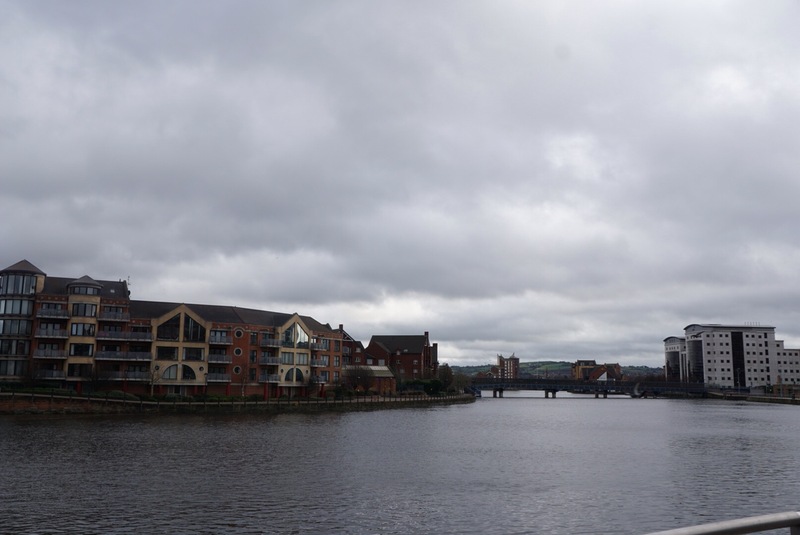 Belfast is a lovely little city, at the foot of the bay with the River Lagan running through it. Belfast today, as seen from the banks of the Lagan. Sheep fields in the near distance of this compact city. My favorite little encounter there was at the museum shop, where they had papyrus for sale. Actual papyrus! I went up to the shop clerk and asked “Is this real papyrus?” To which he looked at me, raised his eyebrows and quipped, “Well, it’s not imaginary is it?” The museum, by the way, is excellent, with a nice selection of dioramas, a walkthrough all of Irish history from prehistoric times, and lots of hands on stuff for kids. 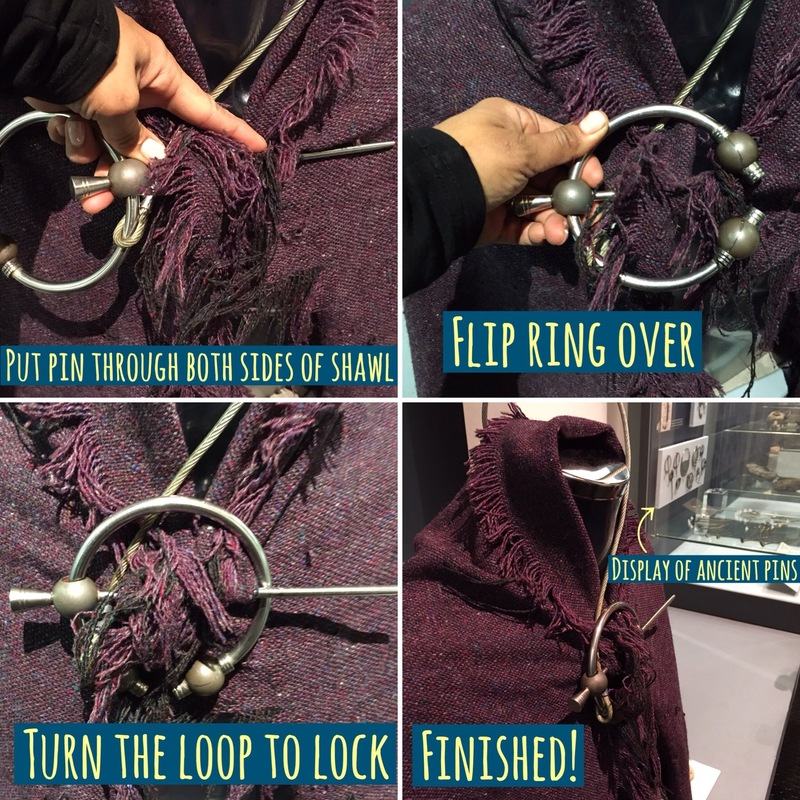 They had a replica of a penannular shawl pin, used in the Medeival period, and we could finally see how to actually put one on! My other little story about Belfast is from a coffee shop we went to in the morning. The guy sitting in the chair next to us was speaking loudly with a thick Bronx accent into a flip phone “Did you find the DNA on the body? Because I know who did it! And if you find the DNA it’ll prove it!” We assiduously avoided eye contact while trying to maintain ear contact. The police on the other end were clearly trying to stay professional and saying they couldn’t give him any info. He later came over asking if we could help him text, and at first I and the boy were like “Sure! We can help! We are nerds! We know lots of things!” And then realized that we were going to help someone who clearly a) had mental issues and b) may or not be involved in something unsavory. I looked at the boy, widened my eyes and shook my head slightly and he mumbled some excuse about not knowing how to text on flip phones and the guy walked away. The day before we took an all day tour of Belfast, focusing on The Troubles. For those who may not be aware, a little background on the history of Northern Ireland. As a child, I remember knowing that you didn’t go to Ireland because of bombs and terrorism, but I can’t say I knew much about it other than that until now, and I suspect that most non-Irish people my age and younger would say the same. Side note: the history of Northern Ireland is as fraught and complicated as that of Israel/Palestine. My goal here is to share what we saw on the trip and talk about the history in very simplified terms to provide background. On both sides were many different official and splinter groups often at odds with one another in their practices, and tensions and emotions are high to this day over who did what and what the proper terminology is. For the purposes of this post, I refer to those who supported British rule as “Loyalists” and those who supported a politically unified Ireland as “Republicans” or the IRA, Irish Republican Army, for short. There is also a religious component in that Loyalists were Protestant and Republicans Catholic, however it is still controversial what degree religion itself played in the struggle. Ireland was a British Colony until its Independence in 1920-21. At that time, Northern Ireland was partitioned off and remained in the British United Kingdom as a majority of citizens supported continued British rule. From 1920 to the late 1960s there were sporadic events of violence, riots and peaceful marches protesting not only British rule but the curtailing of Catholic (essentially Irish) rights. The violence escalated dramatically in the late 1960s until 1998, and this period is known as the Troubles ending when the Good Friday Agreement created a power sharing government in Northern Ireland. In one seminal event, riots broke out over a few days in late 1969 across Northern Ireland after a Loyalist parade near a Republican area resulted in fighting and then violent military suppression by Loyalists. A system of forced internment was put into play to stop the violence. Purportedly for agitators from both sides, for the most part only Republicans were interned. A peaceful march against forced interments on January 30, 1972 ended when British soldiers opened fire and killed 14 people, in the event known as “Bloody Sunday.” [Yes, this is what the u2 song refers to.] Both the forced internments and the brutality of Loyalist police and paramilitary to peaceful marchers did much to recruit support for the IRA. Over the next 26 years, Loyalists and Republicans battled, sometimes in overt firefights, and more often through terrorism including bombings, kidnappings and outright executions. 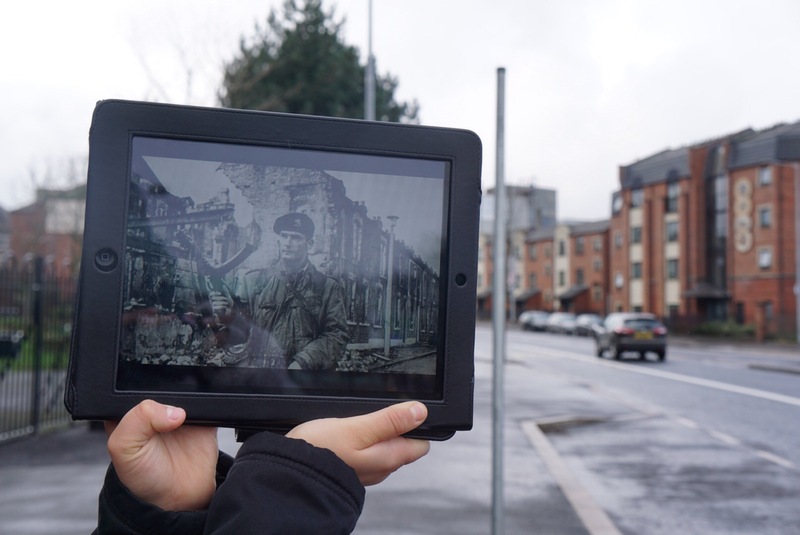 Paul’s tour took us through Belfast to understand what happened during that time and what life was like. 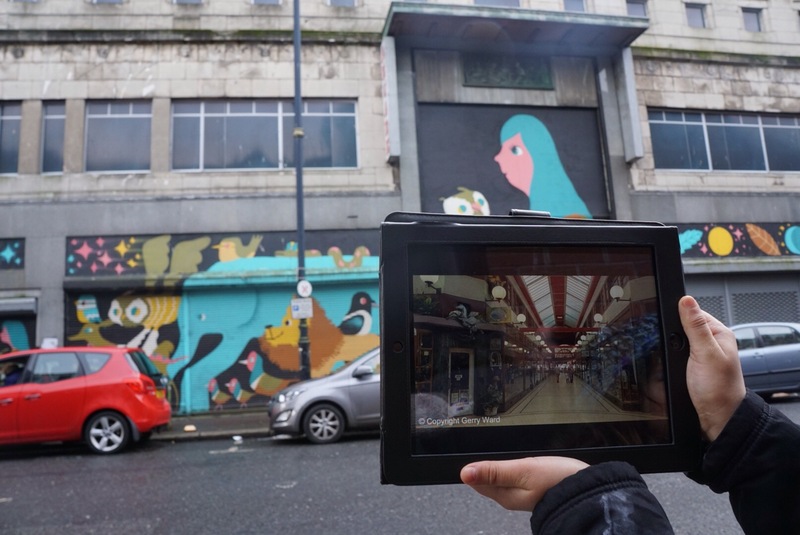 On what is now a bustling main street in Central Belfast was a second-story nightclub, popular with young people and packed to the gills one weekend evening in the early 1970s. Two IRA members had planted a large bomb in the lobby, and were arming it when they were surprised by two off duty British police officers. The IRA members fled, one being shot in the spine and paralyzed from her injuries. The other made it around the corner where he was shot and killed. Accounts vary – the police insist that he was a threat, other eyewitnesses stated that he was already on the ground. The frightened patrons were either led out past the active bomb, not knowing when it would go off, or jumped from second story windows in panic, breaking limbs. One of the aftereffects of bombs such as this was to create an oppressive atmosphere of fear that lingers to this day in its aftershocks. The street now is filled with fast food restaurants and convenience stores, but many of these shut down in the evening and no one is out. 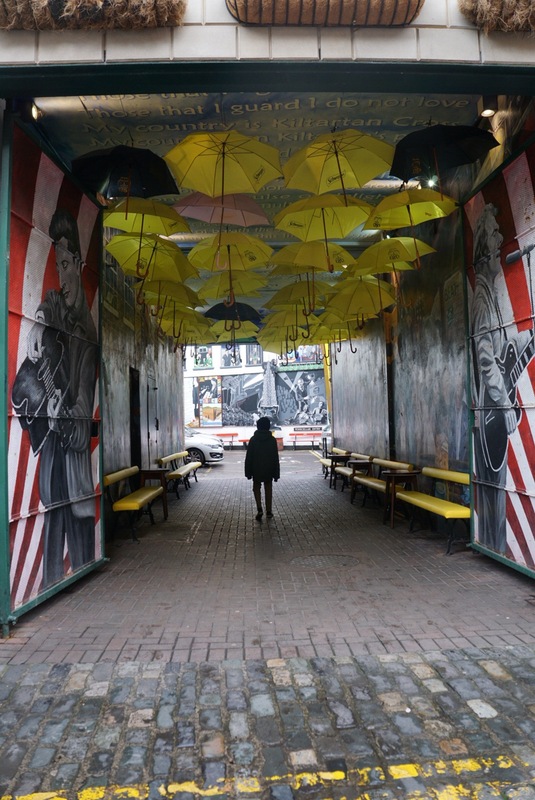 Due to the constant threat of bombs and weapons, main streets were barricaded with checkpoints. Entry required a full search. 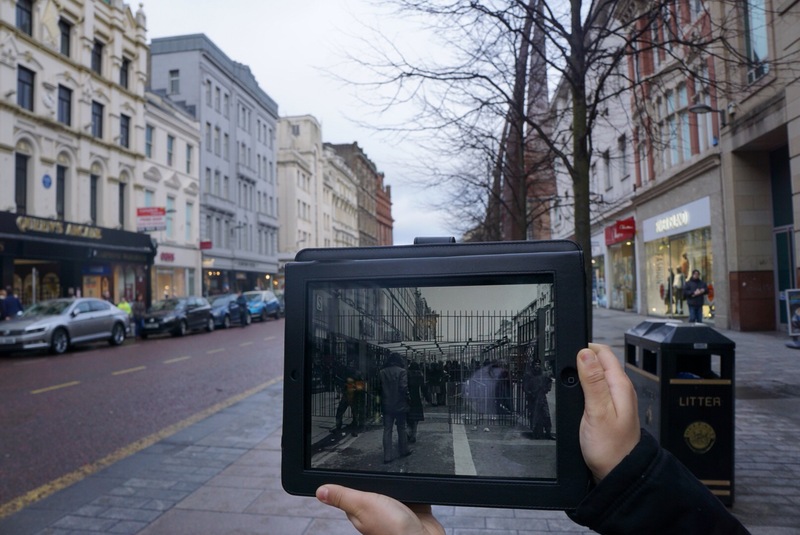 The picture above shows what that street would have looked like in the 1970s, complete with metal bars. Paul impressed upon us the mentality of living in a police state, accepting of curbed liberties and always in fear of death from a bomb. Here used to be an indoor promenade, lined with shops. One day a young woman working in the shops suddenly died when the bomb she had been assembling in the back went off early. Other IRA members had been smuggling in pieces bit by bit through the checkpoints. All of this, again, created an atmosphere of fear. It often seemed to me that the IRA bombings were indiscriminate in that the people killed could just as likely be Catholic as Protestant. Paul tells us of another story, when a bomb that perhaps was meant for an officer’s bar was hurriedly disposed of in a busy family restaurant shortly before it detonated. This bomb was one that got the British Government to talk to the IRA, so the logic went if one bomb can do that, well, let’s make it bigger to get a bigger government reaction. In addition, the bombings were retaliations for aggressions and killings of Republicans by Loyalist groups. In the afternoon we headed to West Belfast, while Paul spoke of July 21, 1972 when the IRA set off 22 bombs throughout central Belfast, and the sky was blackened with smoke, people running in panic to try and find somewhere safe, only soon to realize that there was no safe place to go to. I realize that much of what I speak of here is IRA fueled violence, but Loyalist violence was damaging as well. Catholic civilians who may or may not have had any association with militarized groups were killed, disappeared, or thrown into internment camps. One of the lasting legacies of this time was the construction of “Peace Walls” between working class Catholic (largely Republican) and Protestant (largely Loyalist) neighborhoods, which are still in place today. This blew my mind – in 2017, there still exist cities in which the populations are separated by literal walls. The gates of the walls are closed at 6pm most days and open in the mornings. According to some, the communities still feel safer with the walls in place, uncertain what true unification and open crossings would bring. 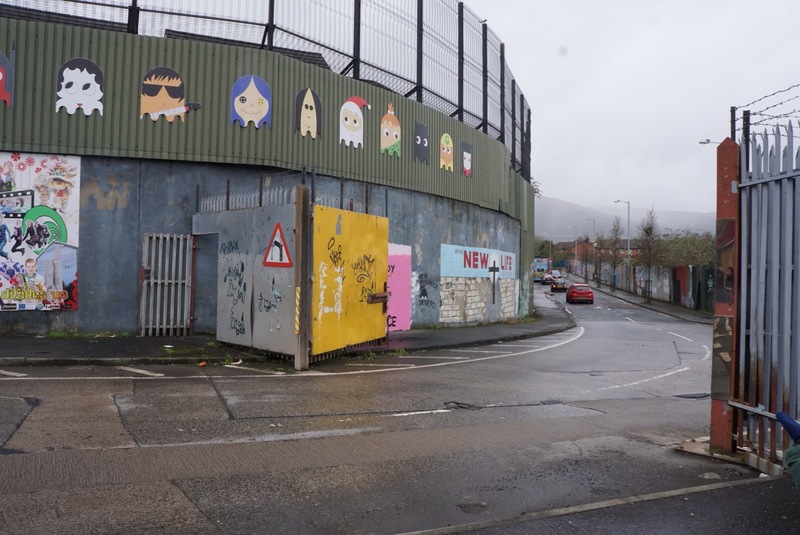 The peace wall as it stands today, separating Catholic from Protestant neighborhoods. Cartoonish artwork seems to try to “prettify” the harsh structure. Today, Belfast is a city which,while rising, still clearly bears the reminders of the bitter struggle, and in someways is ongoing if not violent. The recent election saw a rise of the Republican Sinn Fein party to near equal numbers in the Parliament, meaning that politically the two sides must come to agreements. If they can’t, there’s a possibility of Britain taking over direct rule of the North. It made me think, too, of the current divided States of America – nearly 20 years after peace in Northern Ireland, it is nowhere near true unity – and I wonder what it will take for the US to achieve that.